← Internet censors step in to protect Tang Jiaxuan? The Scarborough Shoal standoff has been good for both China and for other claimants, since they have seen that there is no point picking fights with China. However, while there has been this positive result, it was brought about by others, not China. Is there a lesson in it for us? I’m afraid there is. We must see that while there is a positive side to the Huangyan Island issue, we were the reactive rather than the active side; it was forced upon us. If there was innovation, it was innovation after the incident had occurred, not active innovation. This shows the limitations of the Huangyan Model. The South China Sea issue has been largely influenced by two major factors: the activities of other claimants, and interference from extra-regional powers. But there may be another element, one that we might not like to think about, and that is that for many years we have not done enough. The major problem with the 2002 China-ASEAN DOC is that there has been little progress in “shelving differences and jointly developing resources”. It goes without saying that if you don’t advance, others will. China is sincere in its desire to resolve the South China Sea issues through peaceful negotiation, and has always strived to maintain the status quo, [emphasis added] but others have not done the same. In the past 10 years other countries have been busy, and have rejected joint development with China, to the point where the Huangyan Island incident was created. Engaging in some speculation, let us imagine if the Huangyan Model had been laid down 10 years ago, creating a precedent that China would take immediate and effective action to curb other countries’ activities in the disputed areas, would China be more in control of the situation? The situation is obviously more complex than that hypothetical would suggest but what it does make clear is that only by “taking some actions yousuo zuowei” can the problem be contained and pushed in the direction we want it to go. We should under no circumstances think that if we can only stand tall and exercise forbearance then as China becomes stronger these kinds of issues will naturally resolve themselves. Yousuo zuowei requires the application of military means, but it does not mean fighting a war at any cost, or blindly using military force to seize back the occupied islands. Yousuo zuowei is precisely the kind of strategic approach that can avoid the use of force. It implies smarter and wiser use of the combined power of politics, diplomacy and the military. It implies more active innovation. The hardest path to find is one that does not involve fighting to solve the problem. Yousuo zuowei is highly responsible towards the interests of both China and regional countries. Without it, lasting peace in the South China Sea area will be impossible, and China will not achieve the prestige of being a peacefully-developing great power. There is conjecture as to how many characters the “Guideline” really contains. In 2004 then-Foreign Minister Tang Jiaxuan apparently named all seven in an important work report,(1) and this article found on the CPC’s website also drops the full set. Some put the number of characters at 24, with these sources on government websites lopping off the redundant shanyu shouzhuo — but the term “24 Character Guideline” refers more commonly to a party human resource management strategy. In this Deng Xiaoping foreign policy reader on the CPC website, former diplomat and CPC Central Committee member Liu Huaqiu lists only five of the phrases, leaving out juebu dangtou and shanyu shouzhuo, as does the “20 Character Guideline” repeatedly referred to in this 2010 educational reference document on the Foreign Ministry’s website. The only authoritative voice on these formulations is a 1998 speech in the Selected Works of Jiang Zemin Vol. II, which refers to upholding (坚持) a “strategic guideline” comprising four of the phrases in question: lengjing guancha, chenzhuo yingfu, juebu dangtou and yousuo zuowei. Jiang discussed taoguang yanghui separately in the following sentence, a point i believe may be of some significance in understanding the associated debates. Deng only used the first three phrases in the September 1989 speech that is usually nominated as the source of the “strategic guideline”. The purpose of that speech was to summarise his prescription for how the Chinese party-state should respond to the political upheavals in the Eastern Bloc, amidst concerns about a domino effect resulting in oblivion for the CPC. This was of course just a couple of months after China’s own uprisings had culminated in the Beijing Massacre of June 3-4 of that year, which explains the title’s emphasis on stability: WITH STABLE POLICIES OF REFORM AND OPENING TO THE OUTSIDE WORLD, CHINA CAN HAVE GREAT HOPES FOR THE FUTURE. But by far the most controversial of the four-character phrases is taoguang yanghui, which has achieved the implausible feat of attracting hardline criticism inside China at the same time as inspiring fear abroad. The perception gulf is rooted in its various possible English translations. Until this year, for example, in its widely-read annual report to the US Congress, the US Department of Defense referred to the idiom as, “hide our capabilities and bide our time”. But critics in the PRC media and academia charge that it represents a soft, passive approach that may have been appropriate for the militarily weak state the PRC was twenty years ago, but which today prevents China from using its hard-won new capabilities to protect its legitimate interests (for a summary of these debates see this detailed piece from Dingding Chen & Jianwei Wang). We will only become a big political power if we keep a low profile (taoguang yanghui) and work hard for some years; and we will then have more weight in international affairs. First, we should continue to uphold the strategic guidelines of observing coolly, acting calmly, never taking the lead, and doing some things. We should taoguang yanghui, be modest, protect ourselves, and strive for development. The comparison of our country’s condition with international powers dictates that we must do it this way. Consider the context of the speech in 1998 — just two months after Bill Clinton’s visit, Jiang is believed to have still been fighting a battle against hawkish “leftists” who bitterly opposed his efforts to warm ties with the USA. This suggests that in the current debates, taoguang yanghui may be more than just a byword for conciliatory stances in PRC foreign policy circles. Within the party, discrediting taoguang yanghui could be a means of attacking Jiang Zemin and his contemporary allies. None of the other phrases seems to have been subjected to the same scrutiny as taoguang yanghui — especially not the phrase that has been characterised as its dialectical flipside: yousuo zuowei. 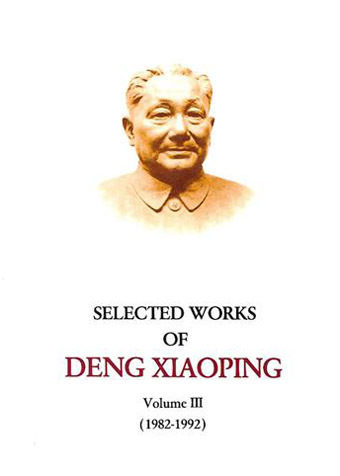 Deng’s 1990 speech continues (in official translation): “Nevertheless, we cannot simply do nothing in international affairs; we have to make our contribution.”(4) Given that Deng was explicitly discussing the issue of third-world solidarity, the translation of yousuo zuowei as “make our contribution” is very appropriate indeed, yet it rarely seems to be interpreted this way in the contemporary debates. Instead, it is invoked as a command that China should be more active in pursuing its own interests — in the case of Ding’s article, control of islands in the South China Sea. The beauty of Chinese is that a promise, statement or contract means – exactly what they want it to mean at that particular moment in time. The meaning is subject to continual change as the conditions change also. There is no contradiction in this as it is thoroughly accepted in China that contracts, statements or promises are dynamic living things and are not at all like the Western notion of a contract or promise, aimed at being a guiding principle across time and space. If you’ve ever signed a contract with anyone in China you will know that the agreement only represents their feelings at that precise moment of signing and a whole host of other factors will soon morph what you thought were concrete agreements into a confusing mess. Hence why Deng’s handy stanza’s serve China’s purpose so well as it develops and becomes more power hungry. Good point, although i should say my experience with contracts in China extends only to rental agreements, of which my own interpretation i recall may have been subject to change across time! Deng’s purported advice has indeed served China well, offering the closest thing it has had to a grand strategy. But as your point also suggests, it’s really not a grand strategy at all but a path of least resistance.